The summer is nearing an end, and school is about to start up. For homeschoolers, we have prep work to do, just like the moms and dads out shopping for school supplies and back to school clothes. But the amount or work and what in involves all depends on what your homeschooling style is. For students that follow curriculum, parents have probably spent the summer watching prices, reading reviews and asking personal opinions of different packages. It can be quite the involved process and the possibilities seem to be endless (probably why I skip this part!). If you found one that works for you, you’ll know. Kids will love it, parents too. But if not, back to the drawing board with your search. Year round homeschoolers are probably back at it already. Why would you want to homeschool year round you may ask? More often than not it’s about flexibility. You have so much school work to do in a certain amount of time. If you want to only do a little bit each day, you can spread it out a bit more. Or if you want to take a few weeks (or even months) off to travel, you won’t fall behind. This allows families to travel during low seasons or to travel on short notice and received better rates. Being traditional homeschoolers (parent led) dipping into unschooling territory, we essentially homeschool year round because we try to make every adventure a learning opportunity. The activities we did during our family vacation this summer will get brought up throughout the year as we dig a little deeper. We visited Parliament Hill in Ottawa, so when the federal election rolls around this fall, we can discuss the roles of the Prime Minister, Members of Parliament and the voting process. We can discuss what provinces and cities we visited as we put together our map of Canada puzzle or add our postcard locations to our maps. We also don’t do workbooks as a frequent or scheduled activity, so if the kids want to do a few pages in one in the middle of the summer, I’m ok with it. The beginning of August was a busy time for us, as fall registration for extra curricular activities and homeschool programs and field trips open up. Within a week, we had worked out the schedules for swimming lessons for the two girls, piano for Chloe (changing it up from dance and choir in previous years) and several science programs throughout the year were booked as they fill up fast. A special field trip for October was also booked, which will see Chloe and her dad head a couple hours south of us for a sleepover at the Royal Tyrrell Museum of Paleontology in Drumhellar, Alberta. Imagine a night at a museum, sleeping under the dinosaur bones! No need to be a homeschooler, this program is open for any students 5-13 and a chaperon for every 5 children. There are still dates available in October and November and still lots of spots available. Chick HERE for more information. Then comes September, a homeschool family’s favorite time of the year! Playgrounds, local attractions, and recreation centres are not crowded during the day anymore, and we can pick up the few school supplies that we do need when it goes on clearance! 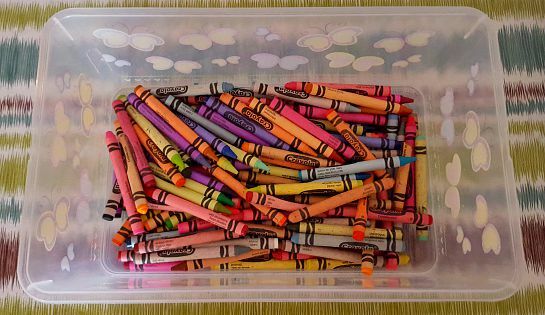 September is a great time to stock up on crayons, you can never have enough! Great post! I’m not sure what I’m looking forward to about September, except getting the ball rolling on this new homeschool year, and hopefully making some new friends, since we recently moved. HI I was just wondering if you could email me or do a post about homeschooling in alberta or edmonton. I am interested to know what the registration process is? and what the requirements are? also at what age does one officially begin homeschooling? what age can you register? does alberta contribute any money? Thank you.